In my last post on diet, I talked about how I found the Atkins diet and later IIFYM/flexible dieting. 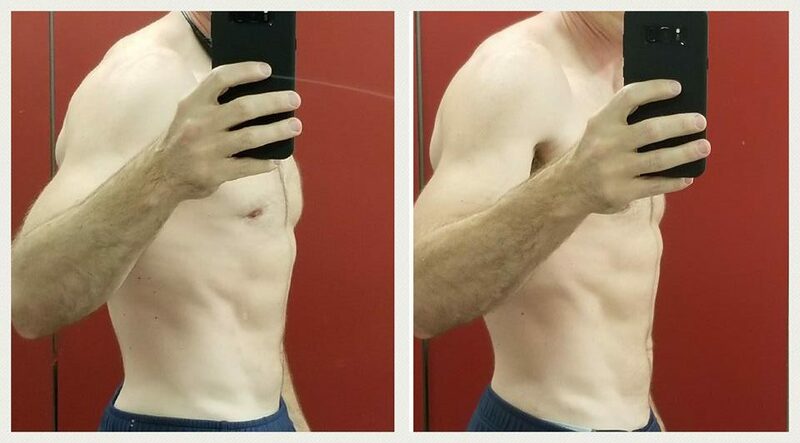 I did Atkins for 3 weeks before switching to flexible dieting. As of today (7 weeks and 2 two days total with 4 weeks on flexible dieting), I have lost 20 pounds. I’m now 192 pounds, down from 212 pounds on January 27. My pants are practically falling off me. By my birthday in May, I hope to be back down to 175 pounds. I haven’t been that light since 1998. 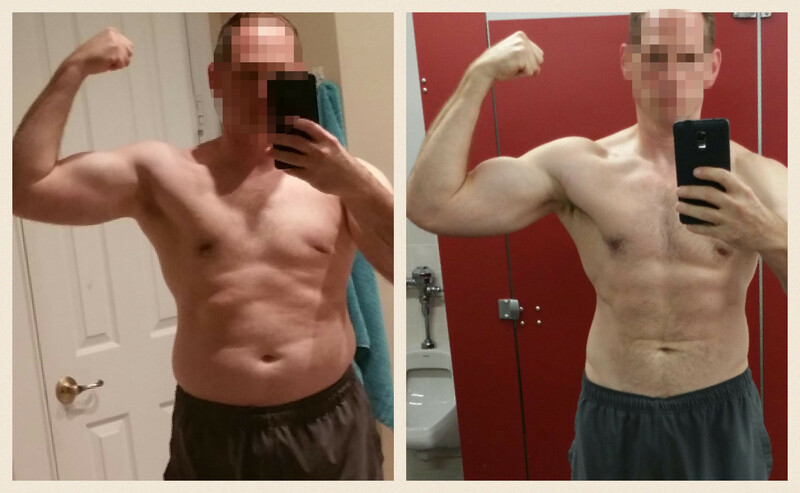 (For longer term updates, see Six Months Later and 38 pounds Lighter, and A Fat Loss Year in Review). But isn’t Diet just Die with a T? 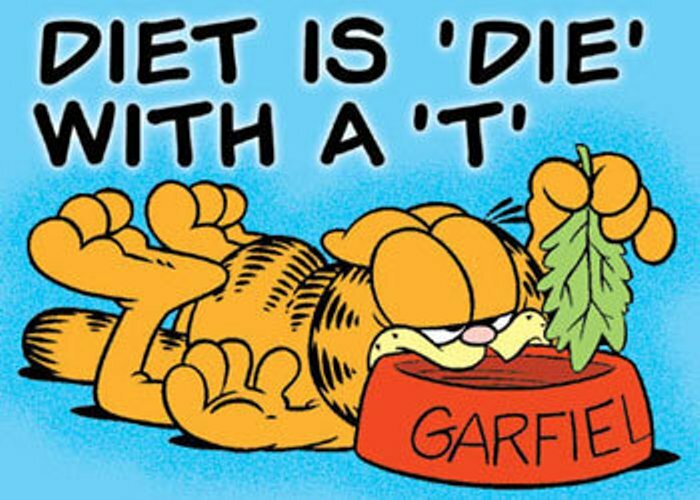 Contrary to Garfield’s opinion, the flexible dieting is quite enjoyable. Believe it or not, with flexible dieting, I get to eat cookies and chocolate, and ice cream (albeit in relatively small amounts). Sometimes I actually have to force myself to eat enough food. In fact, you should eat food you enjoy every single day. If you don’t, you won’t want to stay with the program. Here’s a great video by Radu Antoniu explaining why. Okay so how exactly does this diet thing work? Basically, you just figure out how many calories you should be eating to lose weight. Figure out how much protein you need to not lose muscle mass, and then just eat that amount. Figure out your calorie needs for maintenance. Umm, could you be a little more specific? Okay, you want some details. Although there are lots of complicated ways ways to calculate your maintenance calories, there’s an easy way to estimate it. If you are reasonably active, your maintenance calories are around 15 x your bodyweight in pounds. So if your goal bodyweight is 175 pounds, your maintenance calories are approximately, 15 x 175 = 2675 calories per day. If your goal weight is 130 pounds, then your maintenance calories are approximately 1950. If you are more than 20 pounds above your goal weight, you should take things in 20 pound increments. So if you’re 200 pounds and your goal is 165, calculate for 180 first, then 165 once you get to 180. The cool thing is that if you are heavier than your goal weight, if you just eat at maintenance, you’ll slowly lose weight. But who wants to take several years to lose weight? Let’s kick things up a notch. This is one of those Goldilocks things. If your deficit is too small, it takes too long to lose weight. If your deficit too big, then although you may lose some weight quickly, you probably won’t stick with the plan long enough to make your goal weight or be able to keep the weight off. A pound of fat is around 3500 calories. So to lose a pound of fat a week, you need to eat 3500 calories less per week. Conveniently, 3500/7 days = 500 calories per day. You could just take your maintenance calories and subtract 500 or subtract around 20% of maintenance. Note, this is true in theory, but in actual humans, results will vary. 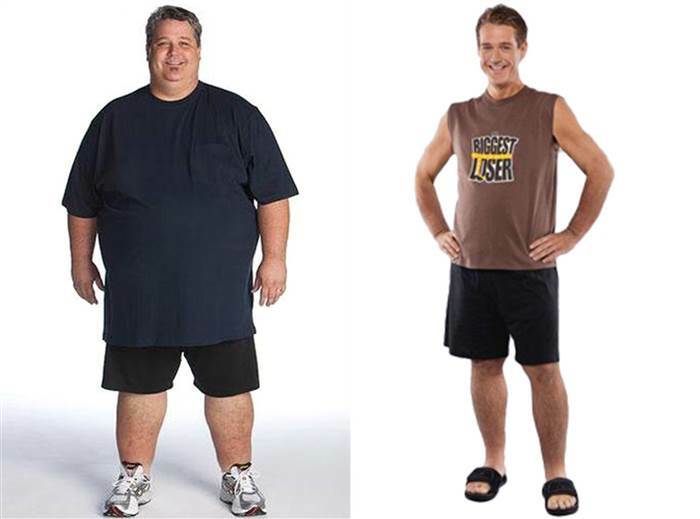 Depending on how fat you are to start with, you might lose more weight than predicted at first but will most likely lose less weight than predicted later on. Macro is short for macronutrients (fat, protein, and carbohydrates). If your goal is to lose fat, and not muscle, then you need to make sure that you eat enough protein, somewhere between .8 and 1 gram of protein per pound of bodyweight. So for our 130 pound goal, the protein intake should be between 104 and 130 grams. This means that your protein intake should account for between 28% and 36% of your daily calories. The rest of the calories should be more or less balanced between fat and carbohydrates, but it can vary from day to day, so one day you might be 20% fat and 45% carbohydrate, and on another, you could be 35% fat and 30% carbohydrate. You don’t have to obsess. Just make sure you’re around your target calories and minimum protein. Here’s another video from our friend Radu explaining it with that cool Romanian accent. How do I track all this stuff? The short answer is, “There’s an App for that.” The two most popular apps are myFitnessPal and myNetDiary. Both are available for Android and iPhone. I started out with myNetDiary, but switched to myFitnessPal. The two reasons I switched are: my University’s cafeteria food is already in myFitnessPal, and you can modify your macronutrient goals without having to pay. There’s a bit of a learning curve to it, so I’ll post a step by step guide in a future article. But aren’t you starving all the time? This is where intermittent fasting comes in. Basically, you skip breakfast. By eating fewer meals, you increase the number of calories you get to eat at your remaining meals. So if you eat 1450 calories for the day, at three meals each meal is less than 500 calories. If you skip breakfast, you can have two 725 calorie meals. If you don’t mind different sized meals, you could have one 1000 calorie meal, and a 450 calorie meal. Which one you eat first is completely up to you. Or you could have a 1000 calorie meal, and then have 450 calories of chocolate instead of dinner. The choice is yours. You might at first be hungry at first in the morning, but within a week or three you’ll actually feel better. As for, me it wasn’t a difficult change at all, because I don’t really like eating breakfast most days. It really helps not to be around food, so going to work, and well…working, I usually don’t feel hungry until around lunch time. And some more of our friend Radu explaining how he does intermittent fasting. No. the fasting is really just a tool to make calorie restriction more enjoyable. It also has the added benefit of reducing insulin, which is good if you’re hyperinsulinemic. But contrary to popular belief, reducing insulin alone won’t make you lose weight. You need the calorie reduction. Personally, i think fasting makes enormous sense for most people, and especially for females in the dating game. Men do judge you by what you eat. I can’t speak for all men, but I think most men don’t want delicate flowers who can only eat 400 calories. They think you’ll be trying to get them to eat 400 calories. If you can pack away a 1000 calorie meal on a date and still look great…well that’s that stuff guys dream about. You mentioned “reasonably active” earlier. What does that mean? One of the things that I truly appreciate about my current plan is the diet first approach. Although programs like P90X and Insanity include diet plans, they are primarily billed as workout programs. I’ve done those programs without modifying my diet, and yes, you get more fit and lose some weight, but you won’t see real results unless you change the way you eat. My current plan puts the emphasis on diet immediately. Most people can lose 4-8 pounds per month whereas most people can only gain 1-2 pounds of muscle per month. So if you want to see fast results, losing fat is way more effective. In my own case, after losing 20 pounds in 2 months, people are constantly telling me how much better I look. (Although I notice they were polite enough not to call me a fat pig until after I lost the weight.) 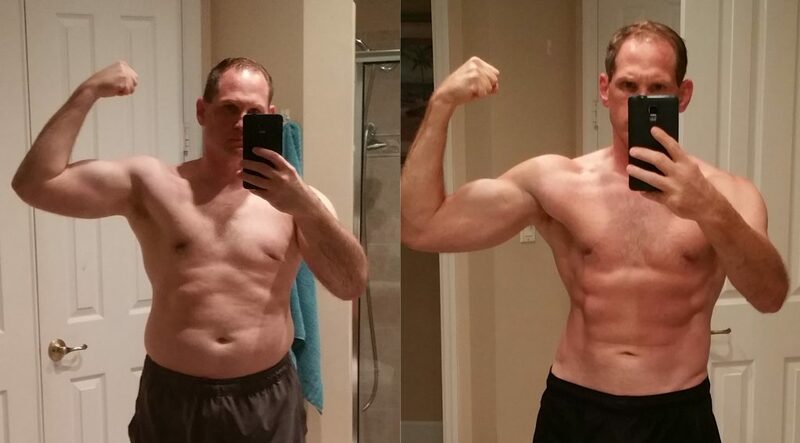 I’ve never had similar results with just working out. 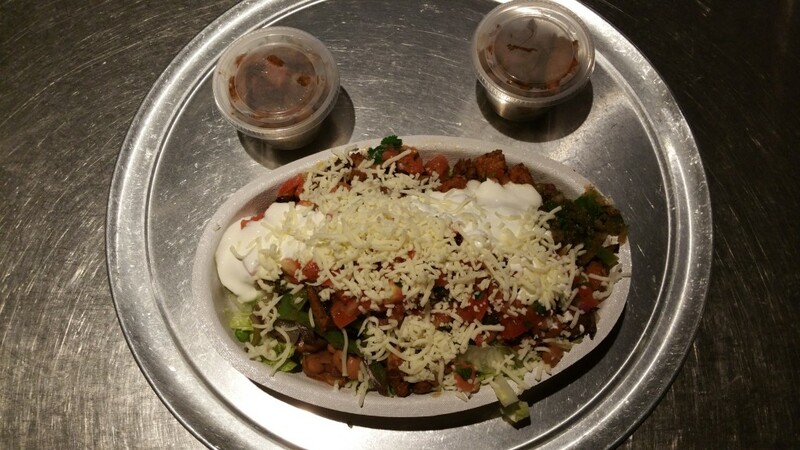 There’s NO way you lost weight eating a 1000+ calorie Chipotle bowl. For Jen’s birthday I had half a Captain Jack’s Buried Treasure from the Palm Beach Alehouse. It’s an Oreo/Heath Ice Cream Pie served over hot fudge (750 calories for half of it; Jen and the kids had the other half.) I’ve never lost weight so easily and felt great and satisfied. Most nights I finish my eating for the day with a 100 calorie chocolate/crunch wafer and a glass of whole raw milk. It doesn’t get much better than that. One of the major mistakes a lot of people make on their diet is a cheat day. I know people who have eaten 4000 plus calories on their cheat days. That undoes an entire week of dieting. Instead, you should do a refeed day. On the reefeed day, you increase your calories by about 500-600 calories. Most of your calories should come from carbohydrates. First, this feels (and tastes) awesome. Second, the increased carbohydrates support leptin production by fat cells. Leptin is a hormone that promotes satiety and encourages fat cells to give up fat instead of storing it. Right. So, reasonably active means you do some physical exertion at least six days a week. If you have a strenuous day job (e.g., construction, beach attendant), you don’t really have to do anything else. Ideally you would do a strength workout 3 days a week for 30-45 minutes, and then do some light/recreational cardio on the off days. For me, working out with weights 3 times per week and and walking for about an hour on the days I don’t lift weights. I usually walk at night after the kids are in bed and listen to podcasts or play Castle Clash. Some people are a little more addicted to exercise and want to do something higher intensity. High intensity Interval training (HIIT) is a good choice for these people. Sprints, hill sprints, bike sprints, jumping rope are good HIIT activities. The key is you don’t have to sweat much if you don’t want to; 45 minutes of walking will do you just fine. The answer is it depends. If you have 60 pounds to lose, you’re going to see faster and more dramatic results than if you only have 10 pounds to lose. 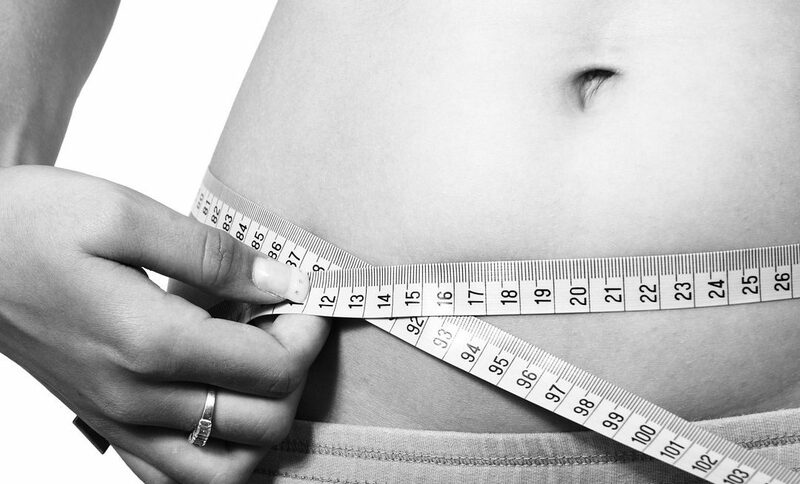 If you’ve already been dieting, it might take longer to lose weight. If you’re coming off a low carb diet, you’re actually going to gain weight at first while your body restores it’s glycogen storage. If you’re completely out of shape, you’re going to actually build some muscle, so you might not see your weight go down at first, but you may notice that your clothes are looser. It’s a good idea to measure waist, biceps, and neck circumference for a men and waist, hips, thighs, and bust for women. Before and progress photos are also helpful. If you’ve already been dieting and losing weight, it’s a good idea to eat maintenance calories for two weeks to kind of reset your metabolism and hormones before going on the calorie restriction. 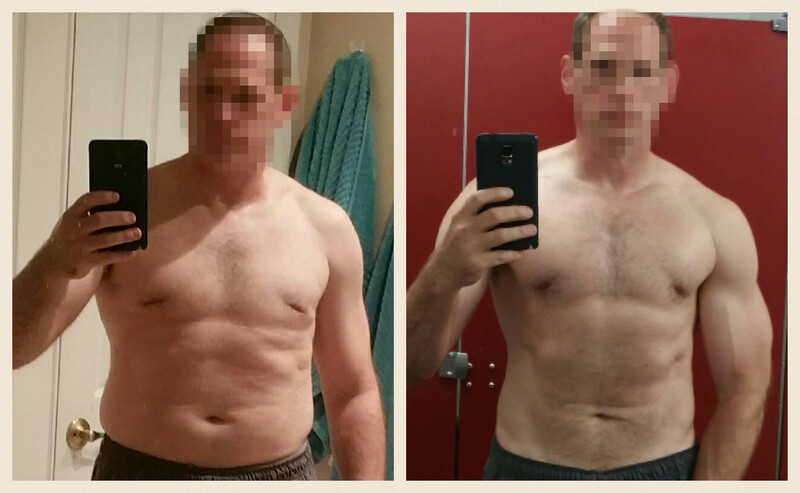 In my case, I had only been dieting for three weeks, so I went straight into flexible dieting, but because I was on the Atkins (low carb) diet, I gained 3-4 pounds and then dropped 8 pounds in the next 2 weeks. 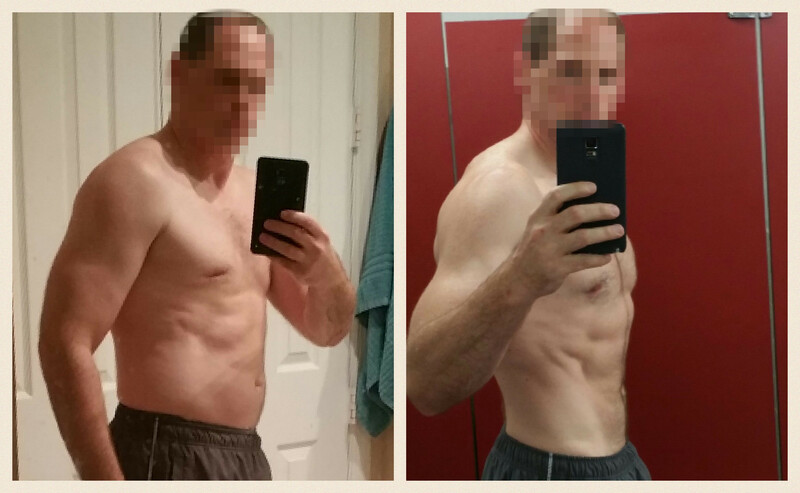 So in general, if you’re starting from nothing, you should see pretty good results within 2-4 weeks. If you’re not seeing anything at all within 2 weeks, try lowering your calories by 200 a day for 2 weeks. If you’ve already been dieting/working out, things may be slower, so give it four weeks before you start mucking around. If you’re consistently hitting your calories and protein, and are reasonably active, you’ll lose weight. 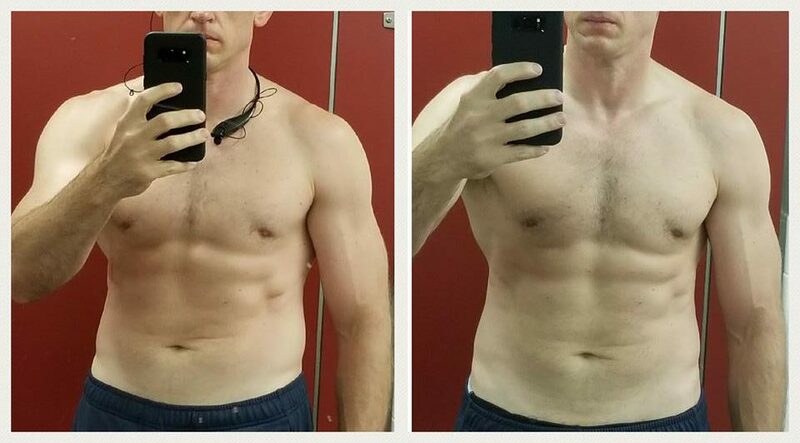 I’ll be posting updates over the next few weeks and months as I continue this journey to buffness. If you want me to e-mail you updates, just fill out the form below.